Danny Lloyd celebrates his Posh goal at Gillingham. Photo: Joe Dent/theposh.com. 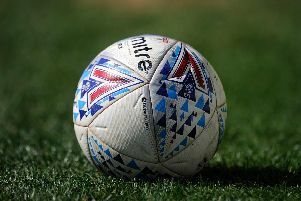 There was heartbreak for Peterborough United at Gillingham today (February 10) as they conceded a last-gasp equaliser. It was a shame as a much-changed Posh team had dominated the League One match for 70 minutes and took the lead through Danny Lloyd before they were forced to settle for a 1-1 draw. Posh midfielder Anthony Grant is challenged by Gillingham's Bradley Garmston. Photo: Joe Dent/theposh.com. Lloyd was excellent for Posh as was midfielder Anthony Grant. The Posh back four were also very good until a late slip-up. Posh striker Omar Bogle in action at Gillingham. Photo: Joe Dent/theposh.com. Junior Morias: (for Bogle, 66 mins). Andrew Hughes: (for Ward, 80 mins). Chris Forrester: (for Lloyd, 89 mins).